Full Circle Bison’s Grass-Fed Buffalo Meat is shipped directly from our ranch in Southern Oregon to our customer’s doorstep. Our buffalo are 100% Grass-Fed for their entire lives. They are raised on Organic Pastures and hay that has not been sprayed with herbicides or pesticides. No antibiotics or hormones are used in producing Full Circle's Buffalo meat. 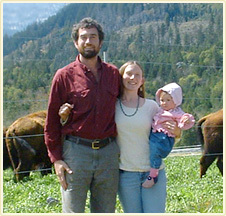 We feel that raising grass-fed bison brings people, animals, and the land back to a healthy balance. Thank you for trying our buffalo meat.